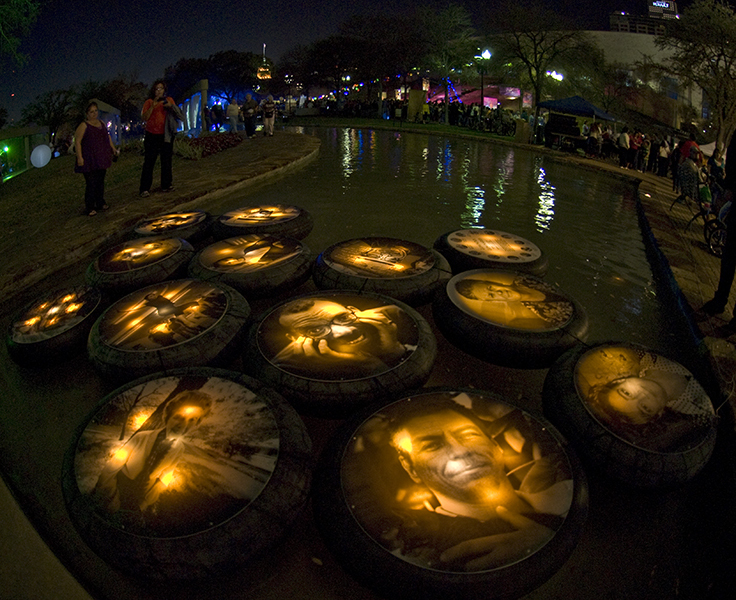 For Luminaria 2011, I created a floating installation of illuminated photographs to honor artists who have passed away and who significantly contributed to the arts and culture of San Antonio. These photographs were be printed on mylar presented between circular pieces of plexiglas floating on intertubes illuminated from below. This idea was an extension of a floating altar I made for the Noche de Recuerdos (Night of Remembrance) at the Woodlawn Lake Casting Pool organized by Erik Bosse, Ramon Vasquez and myself (Proyecto Locos) and sponsored by the American Indians in Texas. A photograph of each artist on inter-tubes were connected in a cellular configuration moving upon the surface of the water in one of the dark pools of water at the base of the Hemisfair Tower. The presentation on water emphasized the mutable transience of life and the inter-tubes being connected was intended to show our artistic interdependence.